It was a game full of ‘nearly’ statements when Sibsey C hosted Lodgers C in Division One of the Boston and District Table Tennis League. The 8-2 outcome, in favour of the visitors, failed to do justice to the Sibsey team’s valiant efforts. Dave Smith started the ball rolling with a battle against Scott Sykes, winning the second end at deuce, and then narrowly failing to win the fourth end 9-11. Roger Hooten had four tight sets against Darcy Proud, but it was to be game six before Sibsey drew blood, Roger beating Andrew Pocklington over five ends. Chris Cooke took a set out of each of the Lodgers players, but it was Dave who picked up a consolation victory, beating Andrew, leaving Chris and Roger to take on Scott and Darcy in the doubles. The home team went into a 2-0 set lead, but were forced into a deuce third end, which Lodgers squeezed through, setting them up for a final two sets win to knock the stuffing out of Chris and Roger. A close encounter emerged when Wrangle hosted neighbours Lodgers B, winning 6-4 with Sam Cooper forced to employ all his energies against a determined opposition. Colin Bell took Sam to five ends, before Sam buckled, but Sam hit back, taking his games against David Kime and Trev Blackbourn in four sets each time. Dave Coulson had an epic 17-15 second set win against Colin, and suffered a deuce reversal against Trev, but hit back magnificently to win all his three games. Pete Evans had a quiet evening by his standards, winning one game, against Colin, whilst Sam and Dave were unable to repeat their heroics in the doubles, going down to Colin and Trev in four sets. Stickney and Lodgers B fought out an entertaining 5-5 draw, a result all the more creditable to a Stickney team deprived of a third player. Paul Hartnett led the way with a fine unbeaten evening, although he nearly came unstuck in the first game of the evening, needing five sets to see off the challenge from David Kime. David was perhaps relieved not to have to face a third Stickney player, since he had another gruelling five setter, this time against Vince Lozynsky, which David won at deuce in the deciding leg. Colin Bell endured a disappointing evening, losing his two games against Paul and Vince in straight sets, and stood down in the doubles, meaning David and Trev Blackbourn faced Paul and Vince in a game which went the full distance, the Stickney pair winning the last two sets to win in five. 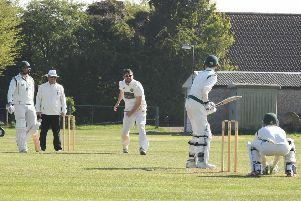 Results: Division One - Sibsey C 2 Lodgers C 8, Wrangle 6 Lodgers B 4, Stickney 5 Lodgers B 5; Division Two - Lodgers D 4 Belchford 6, Lodgers E 8 Sibsey B 2, Graves Park D 7 Sibsey D 3.